This recipe gets you spaghetti Carbonara in a flash. It's a simple and tasty Carbonara recipe, perfect for an elegant dinner. 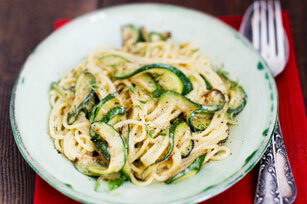 In 20 minutes, you'll have a pasta dish tossed with a creamy sauce, tender zucchini and a sprinkling of Parmesan - spaghetti Carbonara has never tasted so good! Meanwhile, heat oil in a large skillet over medium heat. Add onions, garlic and thyme, cook 3 to 5 min. or until softened. Add water and zucchini, cook 5 to 7 min or until zucchini is softened. Add cream cheese and broth; cook 1 min, or until melted. Add drained pasta and toss to coat. Sprinkle with Parmesan and serve. Swap out zucchini for 2 cups orange and yellow peppers. Serve with a green salad tossed in your favourite Kraft salad dressing.